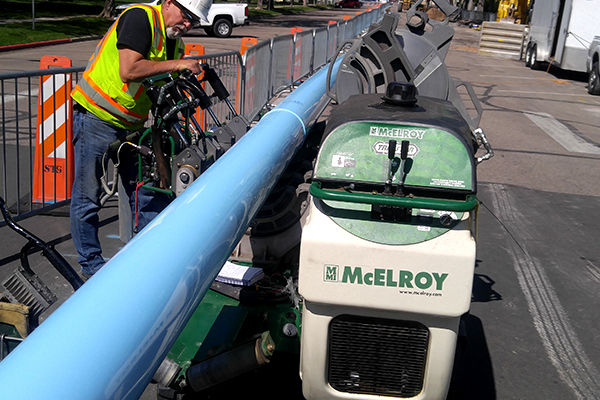 Fusing new PVC waterline for installation during the pipe-bursting process. Pipe-bursting is a trenchless method to replace underground water and sewer lines. Crews dig a pit on each side of the pipe to be replaced, then feed a rod through the existing pipe from one trench to the other. A bursting blade, an expander and the new pipe are all connected to the rod and pulled back through the old pipe. The bursting blades break through the old pipe and the expander, which immediately follows the bursting blades expands the burst pipe, pushing its fragments into the surrounding earth. The new pipe then follows the expander through the length of the existing bore. Once complete, the new pipe is in place and ready to be connected to the appropriate service. By using pipe-bursting technology and avoiding a large, open trench, project time and costs are minimized, as well as overall impacts to the job site.